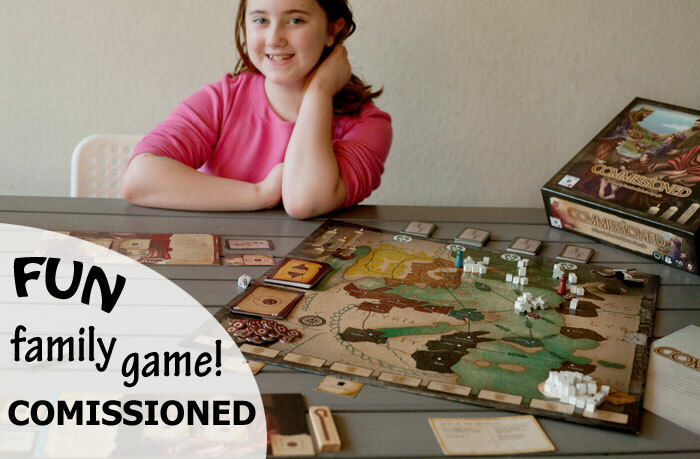 Family Fun Monday – Commissioned Board Game Review! Guess what?!? It’s time for Family Fun Friday – on a Monday! I was thrilled to receive Commissioned from Chara Games so I could play it with my family and tell you guys all about it! If you’ve been around here awhile, you know we’re a family of gamers, and one of our favorite ways to spend quality time together is by playing table top games! When I first saw that a game with a Christian theme was coming up to review, I honestly thought I would pass on it. We love complex, strategy filled, modern board games. We haven’t played Monopoly or Uno in years, and the last thing I wanted was a campy Christian game that would bore me to death. But then I saw the games sitting on the shelf behind Patrick & Katherine Lysaght, the founders of Chara Games, in the “About Us” video on their site and I thought, “These are my people.” So I decided to give Commissioned a try. I’m so glad I did, because this game is right up our alley. 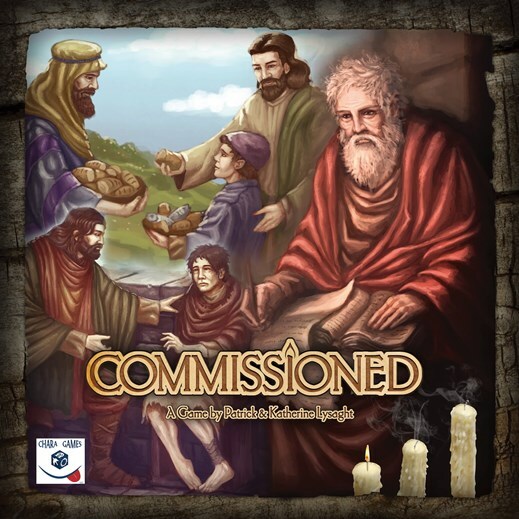 Commissioned is a cooperative board game for 2-6 players. We only have a few other cooperative games, and we love them because otherwise Artist gets super competitive, while Boo wants to be kind and help everyone win, so she has a hard time with games that expect you to sometimes be pretty cutthroat in order to win. The recommended age for Commissioned is 14 years and up, but Artist, who is nine and used to playing strategy games with us, picked it up no problem and even Boo, who just turned seven, was able to play together with us just fine once we helped her get the hang of it. I’m not going to really get into the mechanics of how to play because Patrick has created a great video explaining it better than I ever could. The concept of the game is that you are each playing as one of the early Apostles and you get to play through five different scenarios (each with two levels of difficulty) inspired by the first 150 years of the early church. The first scenario is “Acts of the Apostles” which overviews the spread of Christianity from 33 to the mid 90s AD. You have to work together to plant churches, grow them, and build your individual faith decks, all while facing trials such as persecution, grain shortage, and flood. To win the first scenario, you have to plant a church in every city and collect all the books of the New Testament. There’s also an optional Theme Appendix that explains some of the historical background of the game. If you’re wanting to study the early church, playing through the game while reading the information in the appendix would be a really fun way to get your feet wet! The game itself has exceptional artwork, and high quality construction. It offers a ton of replayability as you can not only work through the different scenarios but also choose different Apostles to play as who each bring a different special skill to the table. You have the option to add in new, more challenging trials once you’ve mastered the first level of difficulty, and there are two different sides of the board that you utilize for different scenarios. Mike and I played Commissioned together without kids the first time through because we knew from our experience with more involved games like this that we should expect there to be a bit of a learning curve. As sometimes happens in you vs. the mechanics of the game situations, we lost. Before we played again, we talked about different strategies we could employ, and went into our second attempt with a plan. This time, we included Artist and Boo in the game and with the four of us working together we won by the skin of our teeth, which was very intense and our victory felt well earned and satisfying! Be sure to hop over to the Homeschool Review Crew link-up to see what others are saying about Commissioned! Great review. Glad to hear about how you strategically played it prior to involving the children. Would have been a good thing for me to have done. This is definitely a fun game to learn and play.